The conflict between America's three prominent generations--the under 35 Generation X; over 35 Baby Boomers; and those over 65 --seems more pronounced each year due to financial burdens, social concerns, and political agendas. GENERATIONS APART features essays on and from all three generations and examines how they see themselves in relation to others. - Publisher :The actual and potential conflict between America's three prominent generations the under 35 Generation X, the over 35 Baby Boomers, and the over 65 Elderly seems more pronounced each year due to financial burdens, social concerns, and political agendas. Xers are perceived as being disaffected from society, apathetic, and politically unsavvy. They live in an environment of ultra-uncertainty and tremendous expectations. Were the Boomers the last generation to make it, and will the demands of the elderly deny the twenty-somethings their future? A powerful, yet quite varied voting bloc, Baby Boomers have families now and they are in a bind. Many can't afford to send the kids to college; they worry about their retirement needs; and they wonder if they will bare the burden of caring for their aging parents. The size of the elderly population is exploding and will further increase as Boomers age. The elderly are politically active and tend to be more conservative. Many elders feel they are being squeezed out of society by generations who don't appreciate their contributions but only see the costs of Social Security and medical care increasing to enormous levels. Generations Apart is the first book of its kind to include essays on and from all three generations, members of each group who explain how they see themselves in relation to the others. 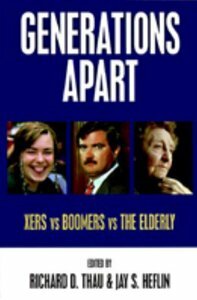 :The actual and potential conflict between America's three prominent generations the under 35 Generation X, the over 35 Baby Boomers, and the over 65 Elderly seems more pronounced each year due to financial burdens, social concerns, and political agendas.